Decorating a Christmas tree is very expensive, especially if you like to change your theme or colors from time to time. 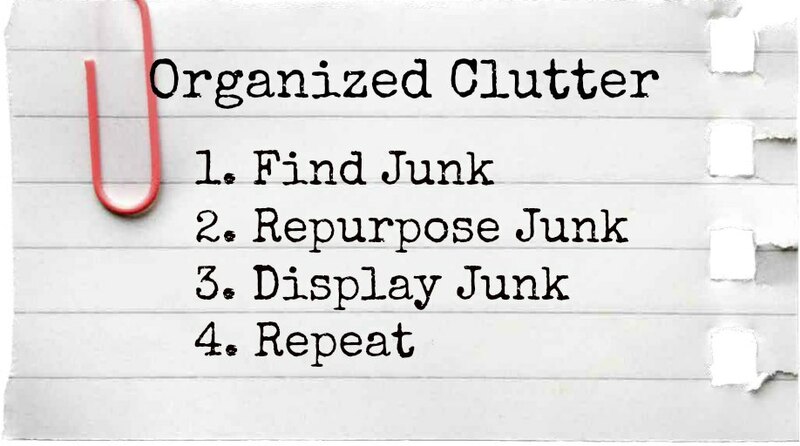 When I want to make a change, I upcycle thrift shop ornaments, repurpose thrift shop items as tree ornaments, or remake some of my existing ornaments. 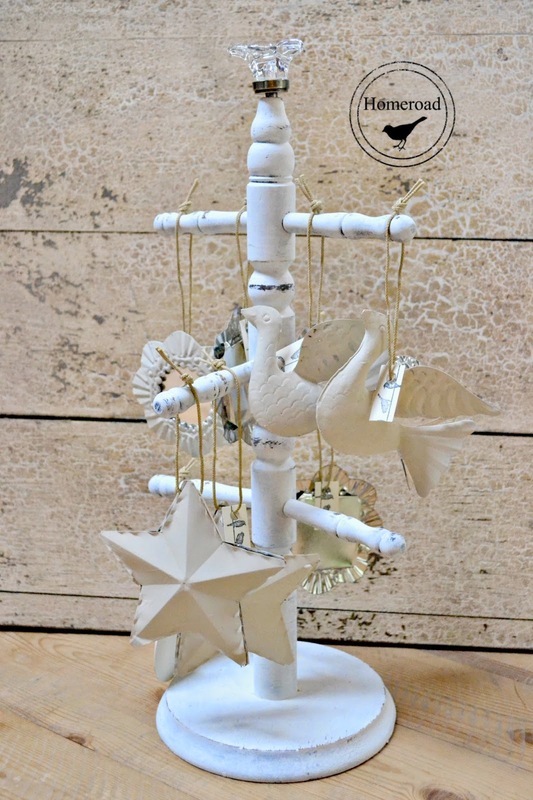 Susan at Homeroad recently upcycled these metal ornaments with chalk paint. I just love them. I purchased these four little wooden violins at the thrift shop for $2 or 50 cents per ornament. I spray painted them with a coat heirloom white first then added one coat of chalk paint that I brushed on, strings and all. I then distressed the edges just a bit with sandpaper. I printed some musical symbols from the internet and applied them with the Mod Podge image transfer method. Almost any graphic can be transferred with Mod Podge. The image must be reversed and printed on a laser printer or a color copier. Then a thin coat of Mod Podge is applied to the image with a foam brush. Apply the image to your piece and make sure all the bubbles and air are pressed out, and then wait for the image paper to completely dry. Next, wet the paper and rub with your fingers until all of the paper is gone. I apply clear wax over my image to protect it. 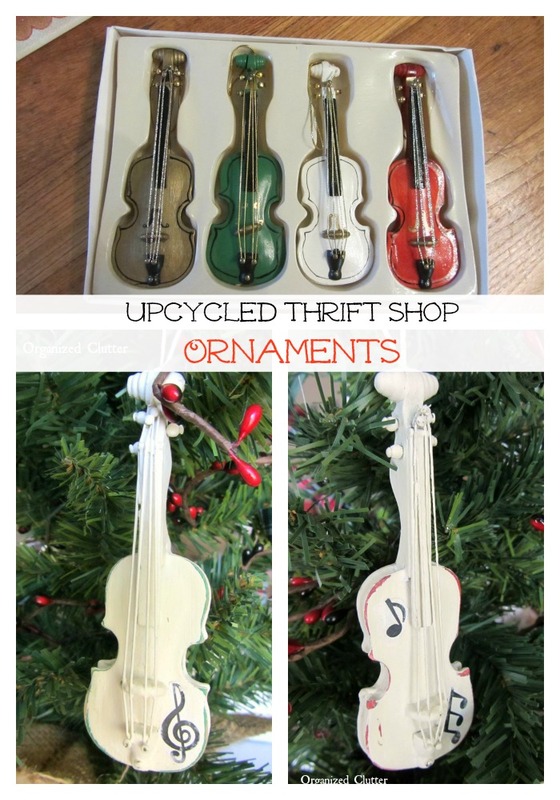 These ASCP Old White violins are perfect for a musical themed or white themed Christmas tree. Pretty Carlene, what a great idea. I mess up when I do it. I think I see what I've been doing wrong. Thanks for the tip.